A girl for all seasons: Be careful what you wish for, you just might get it! The thaw has set in!!! THANK GOD. I got out and about without taking my life in my hands. I headed up to my sister-in-law's house. She was busy making the Christmas pudding. Tradition meant that I just had to make a wish while giving it a stir! Mmm, let me think, what shall I wish for??? A handsome man that won't answer back or run away! Later that night we had our traditional Christmas night out. As I said before, out family is very loaded towards the female side. So my mum and her three sisters, their daughters and now it includes the next generation of daughters, all meet up for a good old night out. Unfortunately this year because of the appalling weather conditions, not everyone could make it. The stalwarts braved the elements. We met up in The Greville Arms. 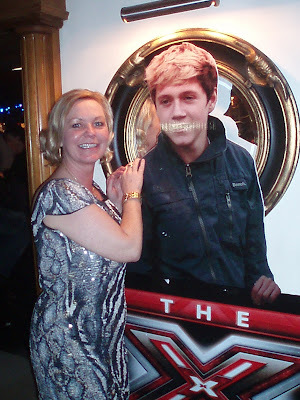 It being X-Factor final night, there was a great buzz around the place, seeing as Niall Horan from One Direction is a Mullingar boy! It's incredible that this time last year he was taking part in Mullingar's Stars in their Eyes, but this year he is in the final of the largest TV show on the planet, under Simon Cowell's influential wings. 2. Won't run away....Check. Well, he doesn't appear to have legs! 3. Won't talk back.....check. Someone seems to have gagged him. Wasn't me, honest! Many, many years ago when we were teenagers, I had a crush on.......Niall's dad! I swear! Same cheeky grin. This is SO wrong on SO many levels. I guess it's back to the pudding bowl for another wish!